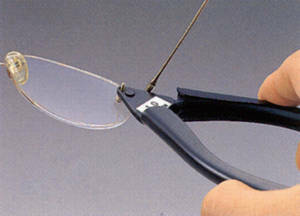 Trims off the screws of a 'three-piece' rimless frame in equal length with a unique cutter, and finishes them off with another small tool. 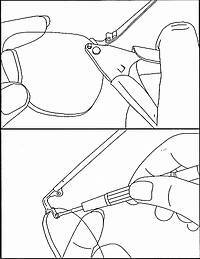 3 types of cutters (0.8mm, 1.0mm, and 1.2mm) are available according to the length to trim. Setscrews on a 'three-piece' rimless frame are cut off to an even length with this cutter and those cut end are chamfered up with the finisher included in this kit. Insert the setscrew of the frame into the cutting hole of the cutter. Lightly press the jaw of the cut to the screw nut and cut off the setscrew. Chamfer the cut end of the setscrew with the finisher. Too much chamfering might rather sharpen the setscrew. 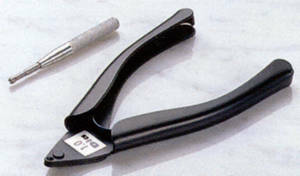 Three type of cutters are available according to the length to finish.